Diversifying forage inventories is the key to pulling through a drought. 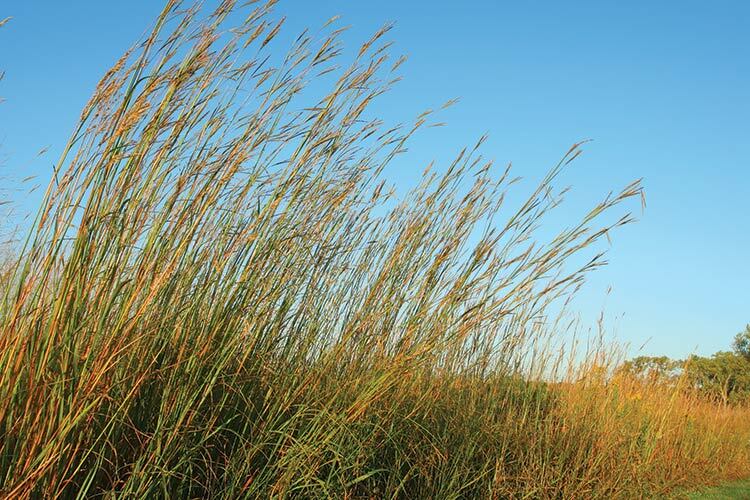 That might include planting annual forage crops or perennial warm-season grasses like big bluestem (pictured). The author is a freelance writer from Bozeman, Mont., and has her own communications business, Cowpunch Creative. Ranchers in Montana and surrounding areas were hit with an unprecedented drought in 2017. For many, it was the second year in a row of such dire conditions. The wildfires that burned through eastern Montana in July only made matters worse. As part of the Montana State University Extension team, Glunk said she spoke with several ranchers during the past drought who reported an inability to get even a single harvest off their hayfields. Along with ranchers being incapable of putting up hay in many circumstances, Glunk noted hay supplies became scarce across the state. For those ranchers who didn’t have access to such alternative forage sources, Glunk said many purchased hay from out of the region. Others were fortunate to receive donations thanks to the relief efforts of those in surrounding states. For some ranchers, however, destocking was the only option. On the extension side, Glunk said she and her associates traveled the state hosting talks and workshops on drought and fire management. In addition, she noted, MSU Extension worked hard to improve the availability of information and publications related to ranching in drought conditions to producers. Those are available at http://bit.ly/HFG-MTdrought. Going forward, Glunk said she believes diversification of forage species is going to be a key strategy for ranchers to better adapt and manage drought. Glunk said Montana ranchers must become better prepared and plan accordingly if they are to make it through future droughts. sudangrass varieties, teff, or millet may offer viable annual forage options. In higher elevations, where growing seasons are shorter and the nights are relatively cool, growing trials have determined cereal grains and other cool-season forages are the best annual choices. According to research published in a report from the Montana Farmers Union in early 2016, studies have shown that since 1900, the average temperature in the state has risen by 2.4°F and the number of days considered “extremely hot” has jumped threefold. Additionally, eastern Montana receives 10 percent less precipitation than it did 100 years ago. Climate models are forecasting this trend to likely continue and possibly even intensify in the years ahead. The global average temperature is projected to rise between 2°F to 11.5°F by 2100. In Montana, data shows this statistic is happening 1.8 times faster than the global average. This article appeared in the February 2018 issue of Hay & Forage Grower on page 22.